﻿ Web App Definition | What is Web Application? A Web application or Web app is an application program stored on a remote server and delivered over the Internet via a browser interface. It refers to any program that is accessed over a network connection using HTTP instead of existing within a device's memory. Web-based applications mostly run within a web browser. 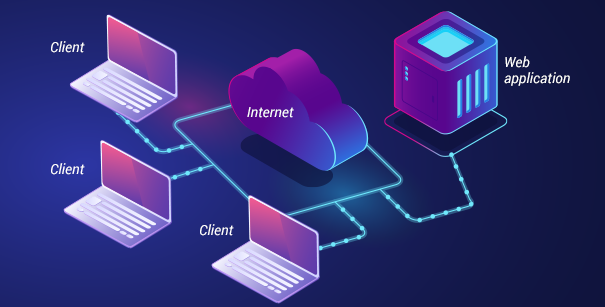 However, they can also be client-based, where a small part of the program gets downloaded to a user's desktop, but processing is performed over the internet on an external server. Web application firewalls (WAFs) are software and hardware solutions used for protection from application security threats. These solutions have been specifically designed for examining incoming traffic to block attack attempts, thus compensating for any code sanitization deficiencies. WAFs use different heuristics to determine which traffic is given access to an application and which needs to be cleared out. Typically, WAFs are combined with other security solutions to develop a security perimeter. These could include distributed denial of service (DDoS) protection services that offer additional scalability required in order to block high-volume attacks. Authorization: Test the application for path traversals; horizontal and vertical access control issues; insecure, direct object references; and missing authorization. Cryptography: Secure all data transmissions. Check if specific data has been encrypted and also whether weak algorithms been used. Also, check if randomness errors exist. Denial of service: Improve an application's resilience against denial of service attacks by testing for account lockout, anti-automation, HTTP protocol DoS and SQL wildcard DoS. Information gathering: Manually review the application, detect entry points and client-side codes, and classify third-party hosted content. Comodo cWatch Web is a Managed Security Service perfect for websites and web applications. This web security tool combines a Web Application Firewall (WAF) provisioned over a Secure Content Delivery Network (CDN). It is a fully managed solution delivered by a 24x7x365 staffed Cyber Security Operation Center (CSOC) of certified security analysts. Additionally, cWatch is powered by a Security Information and Event Management (SIEM) capable of leveraging data from more than 85 million endpoints to detect and mitigate threats even before they occur. Included within the web-based management console, cWatch has the potential to discover and map all devices and web apps on a network and then perform a complete scan, with Six-Sigma accuracy. It can prioritize results of identified vulnerabilities along with detailed instructions to rapidly fix any security threats found. Alerts are instantly sent to the Comodo Security Operation Center (CSOC).